There are two major techniques that are employed to remove a cancerous kidney laparoscopically. Firstly, the more traditional transperitoneal approach, where the retroperitoneum is exposed and opened, and the kidney and the contents of Gerota's fascia are brought into the peritoneal cavity during the surgical intervention. The other technique, which has gained increasing popularity, is a purely retroperitoneal dissection. There are certain relative contraindications and clinical presentations that lend themselves more to a retroperitoneal approach versus a transperitoneal approach. In patients requiring prompt addressing of the renal hilum during dissection and in those patients with large anterior tumors where the transperitoneal dissection may be complicated by a tumor mass blocking the renal hilum, the retroperitoneal approach is superior. In addition, the retroperitoneal approach may be preferred in patients who have undergone prior intra-abdominal surgery, abdominal radiation therapy, or suffered from an intraperitoneal inflammatory state such as peritonitis. Renal tumors, like other malignancies, can involve adjacent organs. Although a relatively uncommon occurrence, the surgeon must be aware of such a possibility and employ preoperative imaging to direct surgical intervention. If adjacent organs are involved, and specifically if the tumor appears to invade into the bowel or adjacent solid organs, and the surgeon feels that to obtain an adequate surgical margin adjacent organs may require resection, then a transperitoneal laparoscopic approach rather than a retroperitoneal endoscopic dissection is preferred. On the right side, the right colon and/or liver may be involved. On the left side, the spleen, the left colon, and the tail of the pancreas can also be involved. 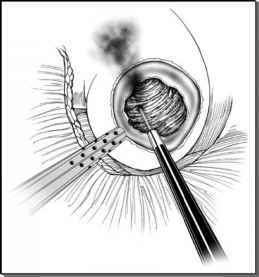 In all these settings, laparoscopic dissection via a transperitoneal approach is preferential.